Every now and then Insomnia gets the best of me. Frustrated, I find myself in bed tossing and turning, wanting so bad to fall asleep. Tonight is one of those nights. I am desperate for a remedy to bring on sleep, but nothing seems to be working. I try my Mom’s trick which is counting backward from 500. She swears that by the time you reach 350 you’ll be asleep, but for me, by the time I reach 490 my mind is already thinking about something else. Then I consider counting sheep… drinking warm milk… taking melatonin…smelling lavender… the list goes on. I once read that the best thing to do is to get up out of bed, perform a small task that takes about 30 minutes to complete, then try going back to sleep. Soooo here I am, 4:22 AM heading out to my kitchen to bake up some pumpkin bread. Tide followed me out here and is now laying on his mat watching me gather up ingredients with the look on his face as if to say, “Whyyy are we up at this hour? And more importantly, can I have a bite?” I reply, “Sorry, no pumpkin bread for puppies.” and throw him a milkbone. He scarfs it down and I begin mixing up the batter. I pop it in the oven and soon enough the kitchen starts to smell like sugar and spice and everything nice. Thirty minutes later the pumpkin bread is cooling on the stovetop and I am heading back to bed to try this sleeping thing again. If this doesn’t work I’m taking a shot of something good and a Tylenol PM. Goodnight! 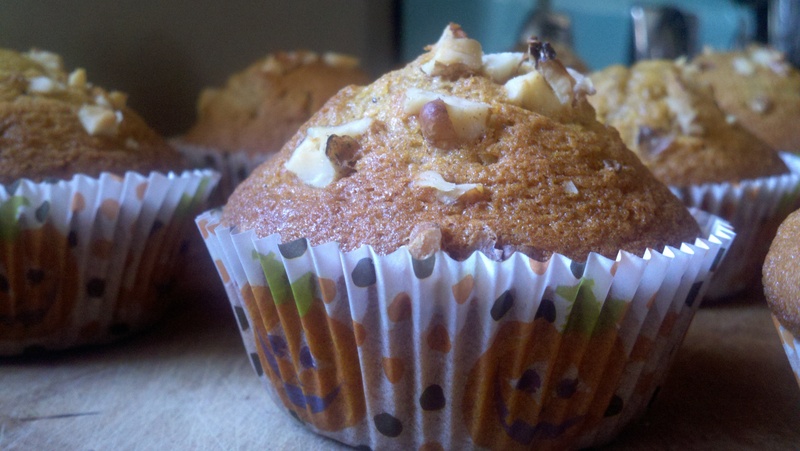 Using a stand mixer and electric mixer, blend together sugar, oil, eggs, and pumpkin. In a separate bowl combine flour, baking powder, baking soda, salt, and spices. Add the dry ingredients to the wet ingredients alternating with the milk and continue mixing until batter is well combined. Pour either into 2-3 loaf pans or muffin pans. Bake at 350 for about 20 minutes or until toothpick inserted into center comes out clean.